It’s been over ten days that I have written something in the blog. My health hasn’t been too great and I am now recovering from a viral infection. Ankur has been too busy taking care of me and managing regular office work and hence, he hasn’t been able to devote time to blog either. Our flight lands in Vienna at about 8 pm. We have already booked our car at the airport and will drive straight to Melk without spending anytime in Vienna on this day. Staying in Melk will help us save some money as accommodation is cheaper here and will give us a head start into the trip. Its really about spending the night as we will be too tired from the long flight during the day. This is the day that our trip truly starts. 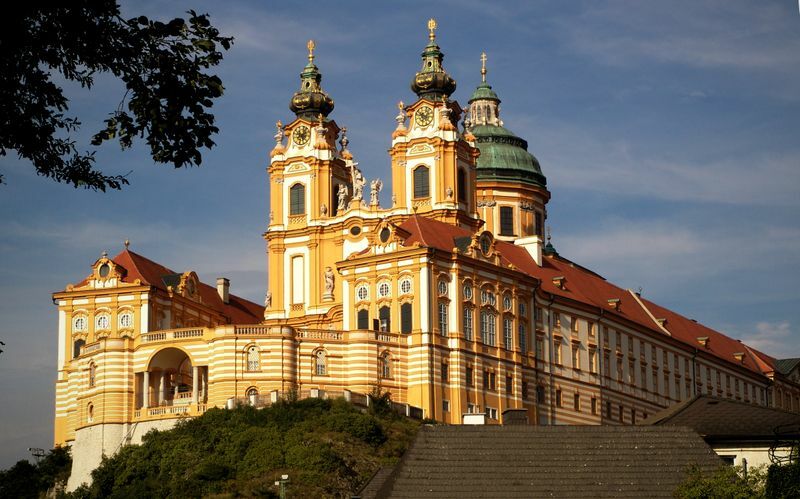 We intend to start the day really early, with a cup of coffee and sandwich and some morning prayer at the Melk Abbey. Visit to the abbey is possible with or without a guided tour 9.00 am – 5.30 pm (last admission at 5.00 pm). From November to March: the visit is possible only with a guided tour daily guided tours in English at 11.00 am and at 2.00 pm. The tour lasts 50 minutes and I am looking forward to spending some more time in this Benedictine abbey that has witnessed centuries of faith in the making. At about noon, we will make our way to Hallstatt with a stop at the Dachstein Caves to see the ice caves. The drive from Melk to Dachstein Caves should take us at about 2.5 hours and we are budgeting about 3 hours for the cave tour. Thus, we should reach our hotel in Hallstatt by 6 pm, in time for supper. Hallstatt has made its way to UNESCO list and has sites that are perfect for a postcard – a crystal clear lake, pretty wooden houses with flowers blooming in spring, walking trails to reach tranquil spots and cafes to let you soak it all in. 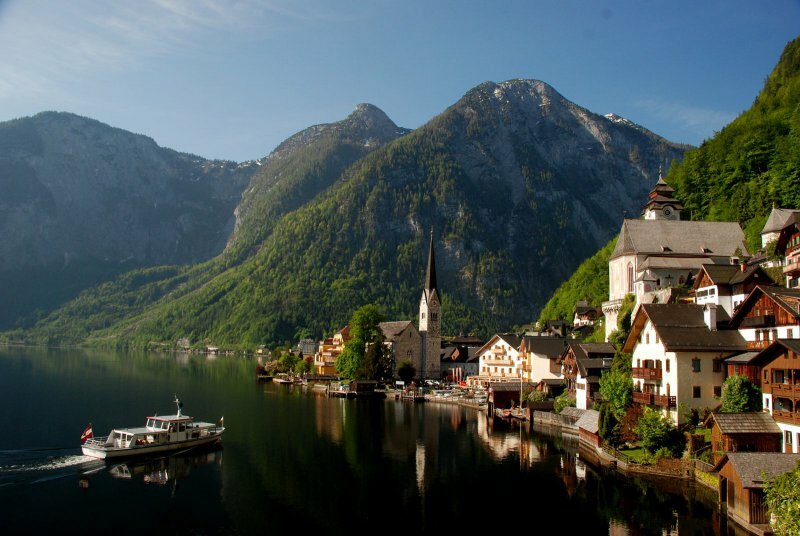 We will spend the night in Hallstatt, which is also the most expensive hotel of our entire trip. While a lot of people visit Hallstatt as a day trip from Salzburg, we want to spend a little more time here. There is so much to explore in the area… boating on the lake, trekking over the slopes and visiting historical sites like the salt mines. The salt mines at Hallstatt are the oldest salt mines in the world. We will be doing the salt mine tour, in the little carriage that whizzes down into the earth’s belly…. just like Temple Run! After an early lunch, at about noon, we will leave for the little ski town of Bad Gastein. This little town has a spa complex called Felsentherme, where we intend to relax our bodies a bit. 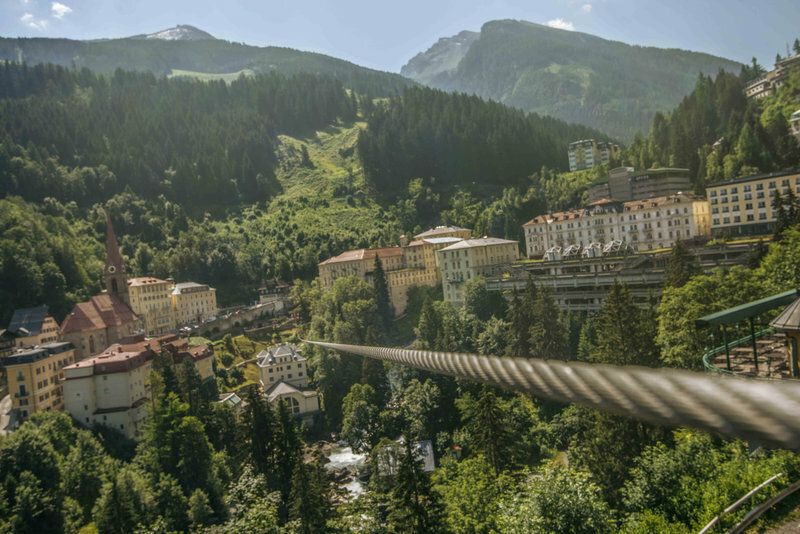 Next morning, at Bad Gastein itself, a little adventure is lined up – ziplining over the Alps and waterfalls and visiting the suspension bridge. We then move on the next destination, Alpbach. Our drive to Alpbach is through the famous Grossglockner High Alpine Road, one of the stellar passes in the Alps. In fact, driving on the Grossglockner High Alpine Road is on my bucketlist. Honestly, Ankur will drive as I will be to busy enjoying the scenic route and going shutter crazy! Hopefully, the weather will be clear and we will be able to enjoy a lunch with good views at Edelweissspitze en route to Alpach. 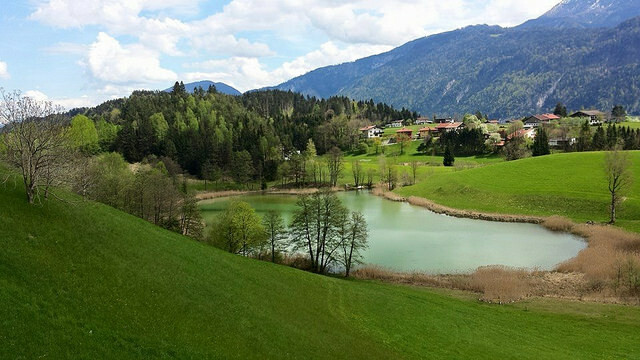 Alpbach has made its way to our itinerary as it has been adjudged as Europe´s most beautiful flower village and we should be able to reach our little cottage, with flowers blooming on the window sill by evening. There is nothing that we have planned to do in Alpbach, except enjoy life in the little village, prance arounds on the foothills of the Apls and feast on a picnic basket, loaded with apple strudel and wine. In case the woman in me wakes up and wants to shop around, we might head to the Swaroski factory at Wattens. 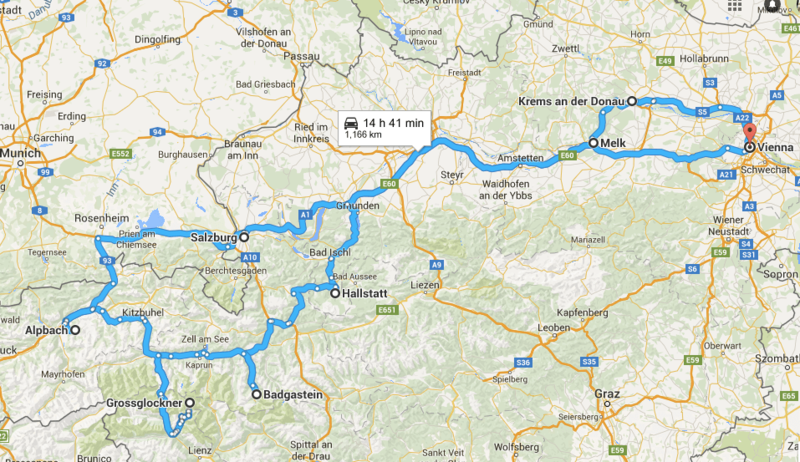 Innsbruck is also a couple of hours away from Alpbach, and we may go there for a day trip. While we have kept this option open, it is unlikely that we will visit Innsbruck. The city has so much to offer that we will spend at least two days there when we visit the Black Forest area in Germany. We intend to leave Alpbach for Salzburg at about 9 am and should reach our destination by 10:30 am. Our walking tour of the city starts at 11:00 am and we will spend about 3 hours exploring sights of the city, which was home to one of the greatest musicians of all time – Mozart. The Hohensalzburg Fortress, Mirabell Gardens and Mozart’s House are on our must see list. Salzburg is the place where the legendary movie Sound of Music was shot and there are tours that take one to all the shooting locales. While I did enjoy watching the movie, neither Ankur nor I are too keen on doing the tour and will probably give it a pass. However, we are looking forward to the evening – dinner with a live Mozart music concert. The last concert that we heard in Europe was during the Dubrovnik Summer festival. The music still echoes in our ears and we long for a similar experience again. I am carrying a pretty dinner dress for the occasion and Ankur is carrying his dinner jacket. Cheers to the romance! What is life without some bubbly? The region between Krems and Melk by the Danube river is famous for its wine. I saw pictures of the place and was reminded of our stay in the vineyards of South Africa in 2010. I really want to relive the experience and hence, we have rented a cosy little cottage by the riverside. The area is easily navigable by cycle. We will rent cycles for the day to hop from one vineyard to another. Also, I understand that July is time for apricot trees to bear fruit. The house that we are staying in has dozens of apricot trees, which will, hopefully, be laden with fruit when we get there. I am already drooling thinking for the sweet, juicy apricots! We believe that our love for wine and bubbly will not let us leave Krems early in the morning. We might hop on a boat that sails on the Danube and stops for wine tasting, offering ravishing views of the vineyards. We might detour a little and swing by Mohndorf to see poppies in bloom. Hopefully, by lunch, we would be happy enough to drive to Vienna and explore the city, brimming with art, architecture, culture and culinary delight. There is so much to do in Vienna, that two days do not seem to be enough. I will write down a separate post for a two day Vienna itinerary, that outlines what we did during our stay in the city. Here is the list of sites that we want to visit while we are in this lively city: Belvedere Palace, Schonbrunn Palace and zoo, Spanish Riding School, State Opera and Hofburg Palace. My taste buds are aching to savour some Sacher Torte at the famous Sacher Hotel. The experimental chef in me wants to learn to make an authentic Austrian Apple Pie. Ankur wants to spend a few hours watching people go by while he sips his coffee to get a peek into the coffee culture of the city. Looking forward to a good time in Austria. Keeping our fingers crossed for another fantabulous road trip!